First room painted a color, check! 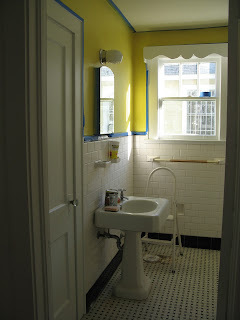 The guest bathroom is the smallest room in the house, and thereby the easiest to tackle, so I painted it today. Prepare yourself, it is bright! Wanted to bring a little sunshine in, and we did! I still need to take the blue painter's tape down, and we are replacing the pedestal sink and toilet, but it's a good start! Color: Sherwin Williams SW6901 Daffodil. Brian worked on the shed, while I painted. He was able to finish the battens and installed an exterior light fixture over the door. We also did a few other small tasks around the house... the end panel on the kitchen desk, spray-painted the existing house numbers to be re-installed soon, and tried to work on the push panel/knobs for my closet door. All in all, a good day! Not to mention that we were in Lowe's for at least 2 hours (maybe more) shopping for under-cabinet lighting for the kitchen, door knobs for the closets, choosing a grout color for the slate, and much, much more!